Don't fear! You'll be jumping in to your first wetsuit purchase in no time. The Shorty Suit - With shorter arms and legs that end at the elbows and knees, shorty wetsuits are ideal for summer days, warmer water activities and always worth packing in your case for a holiday. The Full Suit - These are also referred to as steamers and they consist of a one-piece wetsuit that fully covers the arms and legs. If you like to stay in the water for considerable periods during chillier weather then this is the style for you. The Triathlon Suit - These are specially designed to ensure thermal protection and aid buoyancy, while allowing the wearer to glide through the water at speed. The material will be softer and lighter than other suits and ideal for open water. Check out our guide to triathlon wetsuits for more details. Long/Short John - Popular with sailors and stand up paddleboarders too - these armless, shoulderless wetsuits provide good coverage, with the added bonus of an excellent range of movement for your arms. How thick is too thick? Don't sweat it - literally. Choose a thickness that's right for your needs! The desired thickness of the neoprene used in your wetsuit depends on the water temperature you will be immersed in most of the time. Many serious surfers and water sports enthusiasts will own both a summer and a winter wetsuit, in order to enjoy the water all year round. With the changes in technology used in the both summer and winter suits, it is now possible to stay comfortable and warm in all conditions! Mainly for use in tropical climates and great for a vast variety of water sports. Perfect for summer days and warmer water, for sports that will need greater agility and movement such as kitesurfing, windsurfing, paddle boarding, kayaking and swimming. Both shorty suits and steamers are available in 2mm, 3/2mm and 4/3mm options. The 5mm wetsuit is best known as the UK winter suit. Often, they will have 5mm chest and back panels, with 3-4mm arms and legs to improve flexibility, whist maintaining a safe core temperature. These suits are best for board sports in waters as low as 10°C and will benefit many disciplines such as surfing, wakeboarding, or windsurfing. A 6 or 7mm wetsuit is suitable for the conditions where a 5mm just doesn’t quite cut it. You will see these suits being used up north by the courageous, hardy surfers of Scotland through the winter months. In very chilly water we’d also recommend boots, gloves and hoods. A well-manufactured wetsuit with advanced seam technology can make a world of difference. There are different seams on offer with wetsuits. Flatlock stitched seams are comfortable and very hardwearing, but are only used on suits up to 3mm. Glued and blind stitched seams are used on premiums suits, as they allow less water to enter as well as offering a great flexibility. On the top end wetsuits, you will find liquid seams. These allow maximum stretch, whilst acting as a watertight barrier. Back zip, chest zip or zip-free? It's our most frequently answered question on wetsuit buying. Back Zip, Chest Zip or No Zip? It's safe to say that one of the most frequent questions we receive when purchasing a wetsuit is "should I buy a chest zip or a back zip?" A back-zip wetsuit will always be easier to enter and exit, due to the length of the zip running down the back panel. They are great suits and usually a little cheaper than a chest zip. A chest-zip wetsuit is slightly more difficult to enter and exit than a back-zip, however it does have its advantages. A chest zip does have a fluid neck seal, reducing flush when ducking under a wave. It also allows more flexibility across the back area making paddling easier and more effortless. A zip free wetsuit is very similar to a chest zip wetsuit in terms of entry, comfort and flexibility. The main advantage being that less water can enter a zip free suit, as naturally a small quantity of water is able to pass through a wetsuit zip. 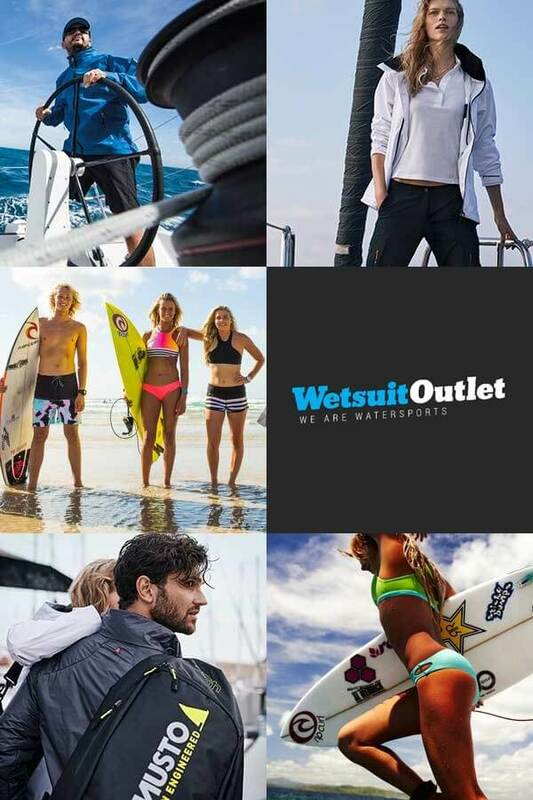 All wetsuits available on wetsuitoutlet.co.uk have individual size charts to help you find the right size for your body shape. Your height, chest and waist measurements are the most important to consider when choosing a size. Getting a good fit is simple - get measuring! Check out our range of wetsuits for men, women and children. Don't forget you can filter by size, colour and thickness to speed up your search. If you do need assistance, our wetsuit gurus are just a phone call away on 01702 295678.